Juan Guaido, president of the National Assembly who swore himself in as the leader of Venezuela, speaks during a joint news conference with Jair Bolsonaro, Brazil's president at the Planalto Palace in Brasilia, Brazil, on Thursday, Feb. 28, 2019. Juan Guaido, who would be paramount leader of a country in upheaval, is on the move. He heads to Paraguay on Friday after lobbying in Brazil for international pressure on the government back home and coordinating a failed attempt to deliver aid across the Colombian border to desperate Venezuelans. Caracas is also on the itinerary for Juan Guaido , the head of Venezuela's opposition-controlled congress who has declared himself interim president. He said Thursday that he will be coming home in the coming days despite "threats," in another looming flashpoint in his power struggle with Nicolas Maduro, the military-backed president targeted by U.S. oil sanctions aimed at forcing his ouster. A defiant return by Guaido to steer protests against Maduro would test the resolve of a socialist government that says the 35-year-old National Assembly leader left the country illegally. Even so, any attempt to arrest Guaido could further inflame tensions in a country where hyperinflation, shortages of food and medicine and other hardships have forced more than 3 million Venezuelans — about one-tenth of the population — to flee the country in the last few years. Just how he will get back into Venezuela, or whether Venezuelan security forces would try to block him, is unclear. In an interview with the Colombian newspaper El Tiempo, Guaido described his secretive exit from Venezuela, a 42-hour trip from Caracas to the Colombian border during which he changed clothes and had to leave behind his bag. "We had to talk to a lot of military personnel, we had to talk to a lot of people who are trying to help us," said Guaido, who has urged the military leadership to turn against Maduro — an appeal that has failed despite the desertions of some hundreds of lower-ranking members of the security forces. Maduro, often combative in public, recently took a softer tone during a televised appearance in which he declared that the annual Carnival season would start Thursday, a couple of days earlier than usual. "President Rhythm, President Passion, that's me," said Maduro, who has denounced his opponents as killers and criminals in fiery speeches reminiscent of the style of his predecessor and mentor, Hugo Chavez. The late leader's rhetoric about imperialism and Venezuela's Bolivarian revolution, along with subsidies for the poor, galvanized a support base that has eroded under Maduro. The United States and about 50 other countries recognize Guaido as Venezuela's legitimate leader and support his claim that Maduro was re-elected last year in a flawed vote. But the opposition leader's efforts to wrest power from his adversary have stumbled, raising the prospect of a protracted standoff in which U.S. sanctions inflict deeper economic pain on Venezuelans. Guaido had announced that last weekend's attempt to deliver several hundred tons of U.S.-supplied humanitarian aid from Colombia into Venezuela would be politically decisive, but Venezuelan forces blocked the aid that Maduro called part of a scheme to overthrow his government. Venezuela closed the border with Colombia ahead of clashes with protesters, inflicting more hardship. Some Venezuelan schoolchildren who receive subsidized education in the Colombian border city of Cucuta have been unable to cross over. Many people in the Venezuelan town of Urena don't have enough food and lack basic medicines that they were sometimes able to get on the Colombian side. 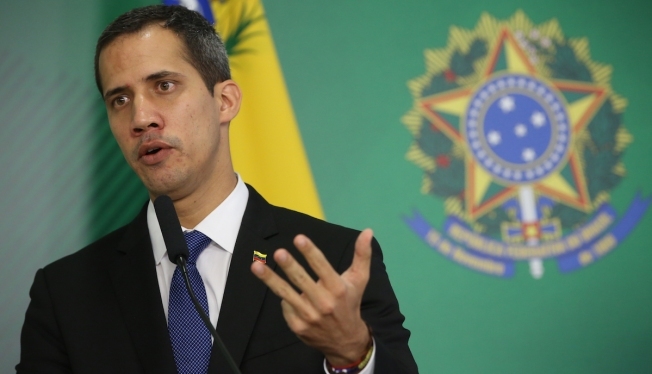 Speaking in Brazil on Thursday, Guaido said: "The regime's formula of violence and persecution does not work and is not working. It's only delaying the inevitable: a democratic transition in Venezuela." The United States remains committed to delivering medicine, hygiene kits and other aid to Venezuela, U.S. Secretary of State Mike Pompeo said. "We are hopeful that over the next couple of weeks, we can really begin to make a dent in that problem," Pompeo said. It remains to be seen whether U.S. sanctions on the country with the world's largest oil reserves will further weaken Maduro, or divert blame for increasing deprivation to the U.S.-backed opposition. While Guaido says all options for Maduro's removal are on the table — a comment interpreted as an openness to U.S. military intervention — Colombia, Brazil and other countries that back the opposition appear more cautious, insisting on a peaceful solution to Venezuela's crisis. Also Thursday, the U.N. Security Council rejected rival resolutions on Venezuela sponsored by the United States, which supports Guaido, and Russia, which backs Maduro. The U.S. draft, vetoed by Russia and China, urged "the peaceful restoration of democracy" in Venezuela, free and fair presidential elections and unhindered delivery of humanitarian aid. The Russian draft expressed concern at threats to use force against Venezuela and interfere in the country's domestic affairs and would have reaffirmed the government's primary role in initiating international assistance.